To me, banana is a holiday fruit. I only eat them when I go on holidays because it’s a quick source of energy and easy to bring along when we go on hikes. So when the grocer gave me some “free” bananas a few weeks back (before we went on a holiday), I started looking for recipes to use them in. I said “free” because the grocer conveniently rounded up a few dollars for the other stuff I bought. I blame it on language barrier, my fault for not double-confirming the price, and his unscrupulousness. Needless to say, I’m avoiding his stall like a plague from now on. 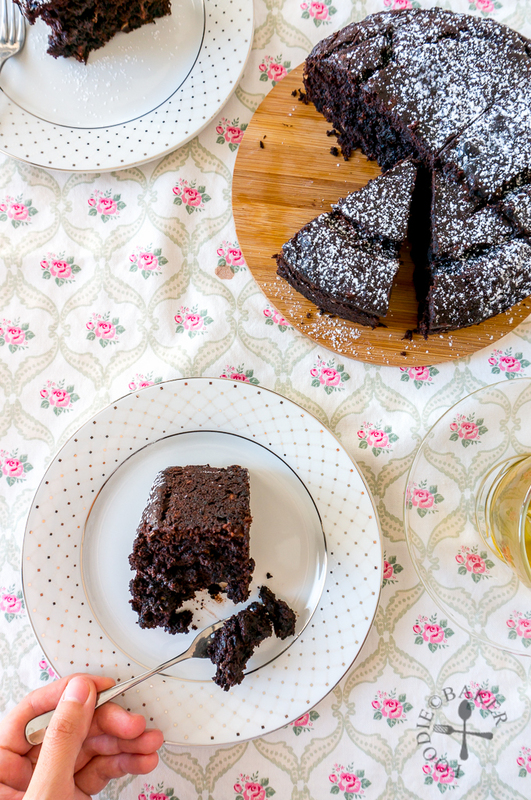 Not to mention that this is a double chocolate banana cake/bread – in addition to the cocoa powder in the cake batter, chocolate chips are added which give it a gooey, melty, chocolatey lusciousness. I used a bar of salted caramel milk chocolate given to me by my friend, but regular (but good-quality!) chocolate chips will work perfectly. To be honest, with all these chocolate, I couldn’t tell there’s bananas inside anymore, but that’s definitely not a bad thing for me! My loaf pan was a tad too big at 8×5-inch and I don’t want a shorter cake/bread, so I used my 7-inch cake tin instead. 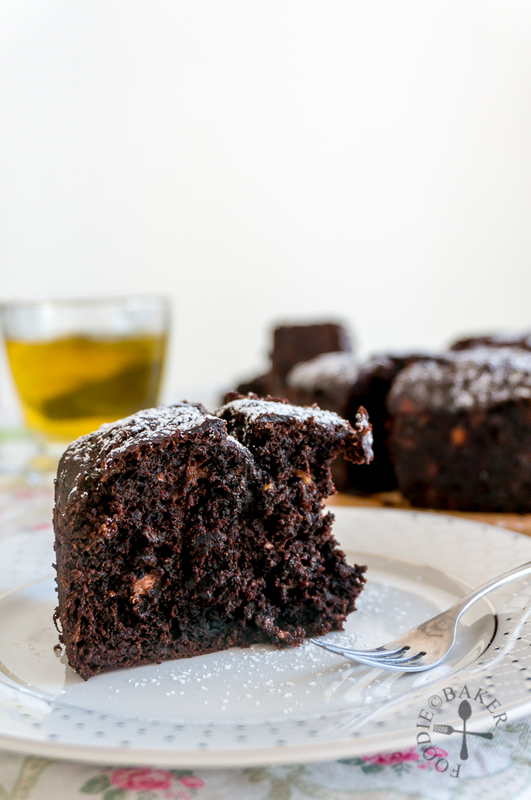 If you have leftover bananas but don’t want to bake a banana cake, give this chocolate banana cake/bread a try. I’m sure you will then wish you have more bananas on hand! Afterall, bananas are incredibly healthy – you can read all about bananas’ health benefits here at Well-Being Secrets! 1) Grease a 7-inch round tin or a 8x4-inch loaf tin. Line the bottom of the tin with parchment paper. 2) Peel and mash the bananas with a fork or potato masher. It's okay if there are still small chunks left. 3) Pour in the glorious gold - melted butter - and whisk with a wire whisk until incorporated. 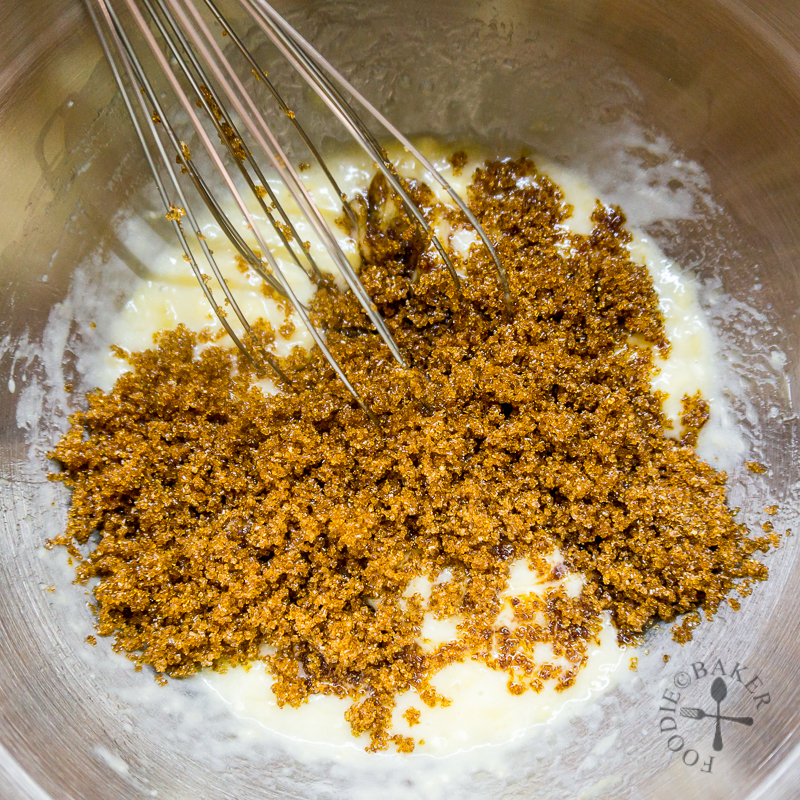 4) Whisk in the brown sugar - either light or dark will work here! 5) Whisk in egg and vanilla. 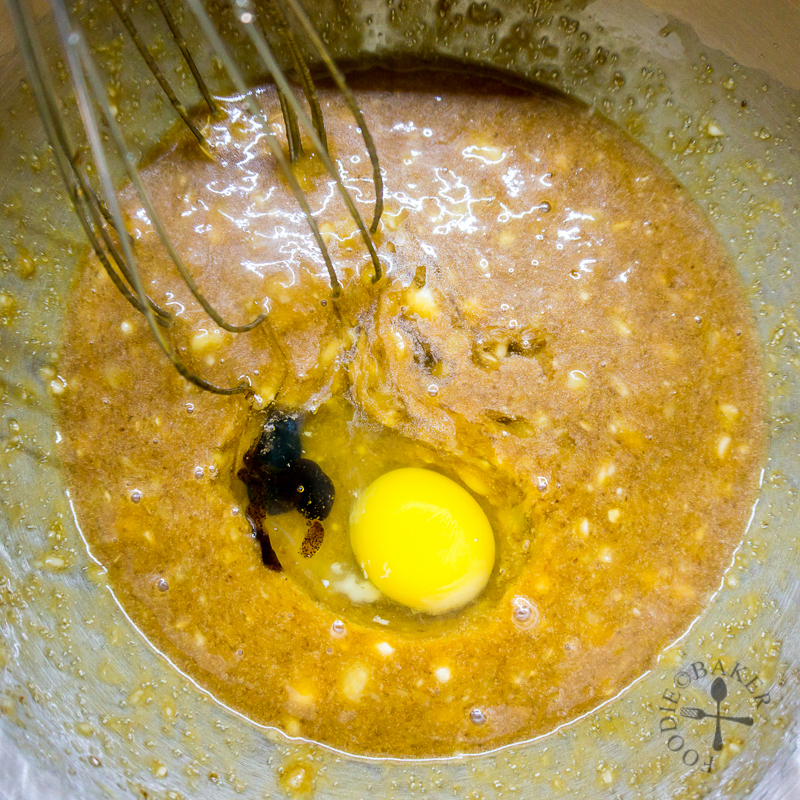 If doubling the recipe, whisk in the eggs one by one! 6) Sift in flour, cocoa powder, baking soda and salt. Use a large spoon and fold in the dry ingredients in a figure-of-eight motion until just incorporated. 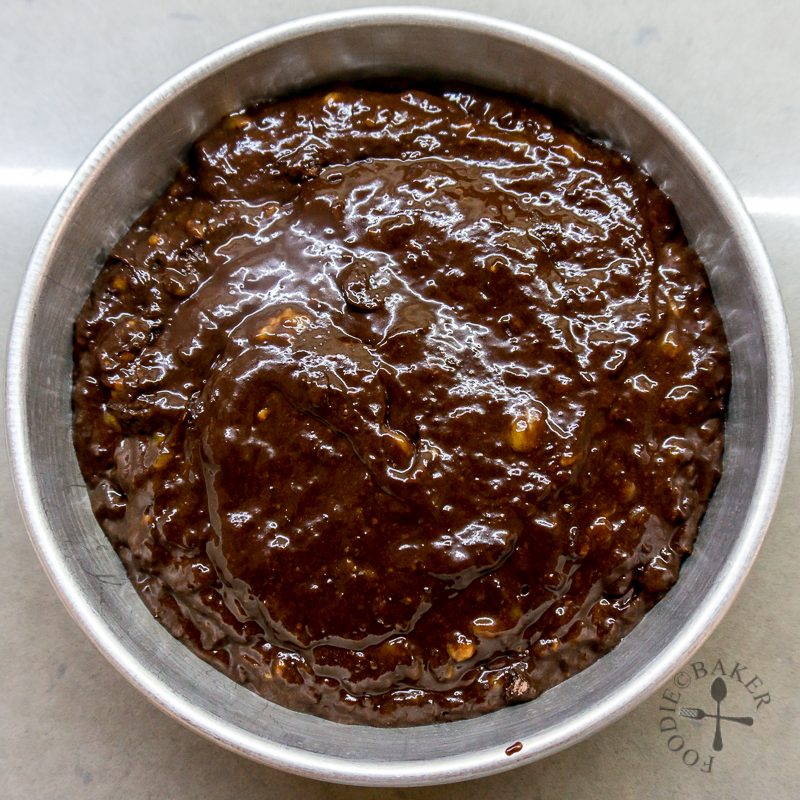 7) Add in the chocolate chips/chunks and stir gently to mix together. 8) Scrape the batter into the tin and send to the oven! Preheat oven to 175C / 350F (non fan-assisted). Melt butter in a small pot over low heat. 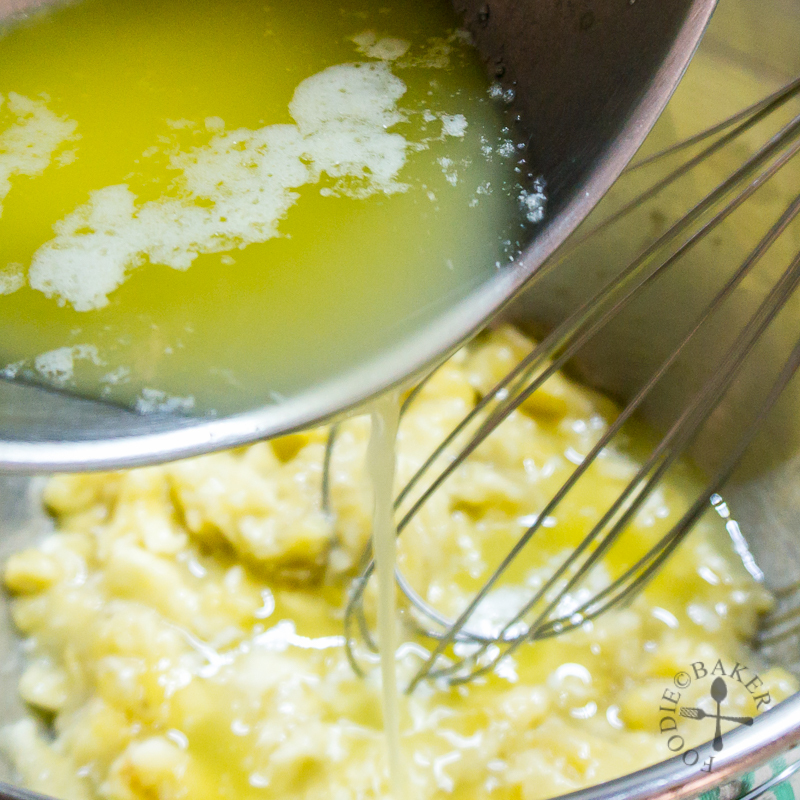 Remove melted butter from heat then take some of the butter and grease a round baking tin (7-inch diameter x 2-inch tall) or a 1-litre loaf tin (8x4-inch x 2.5-inch tall). Line the bottom of the tin with parchment paper. Set aside. Peel the bananas and place them in a large mixing bowl. Mash the bananas with a fork or potato masher. It's okay if there are still small chunks left. Pour in the melted butter and whisk with a wire whisk until incorporated. Whisk in the brown sugar, then egg and vanilla. Sift in flour, cocoa powder, baking soda and salt. Use a large spoon and fold in the dry ingredients in a figure-of-eight motion until just incorporated - stop when you don't see any more streaks of flour. 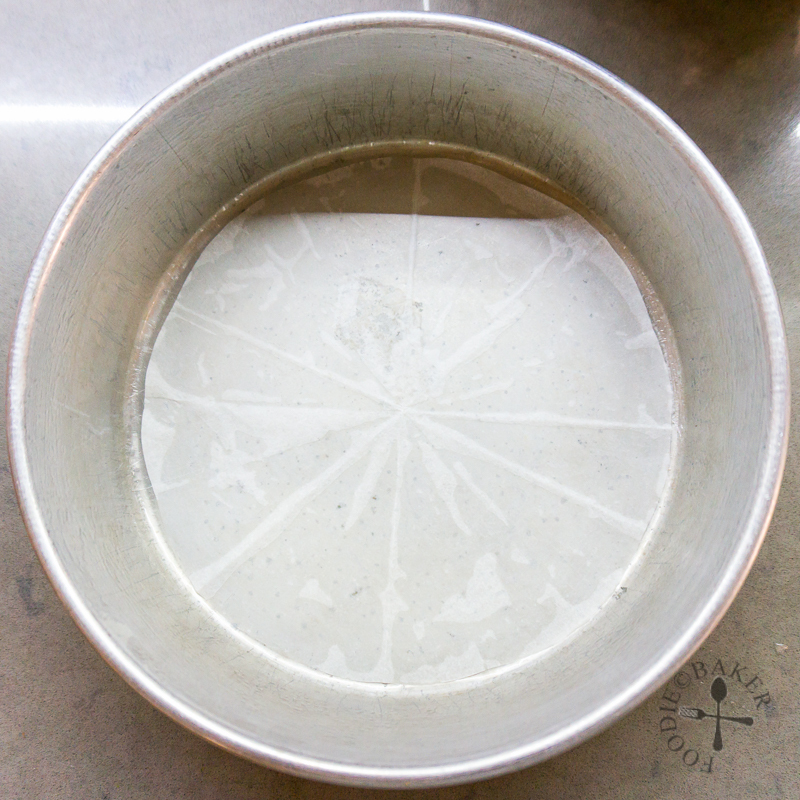 Use a rubber spatula and scrape the bottom of the mixing bowl to ensure all the dry ingredients are mixed in. Do not overmix. 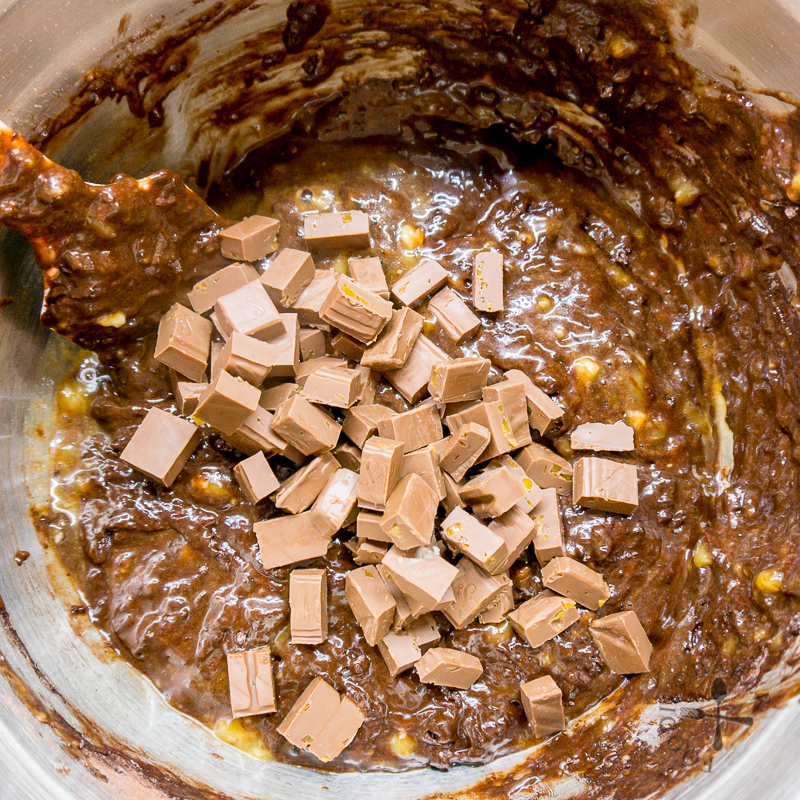 Add in the chocolate chips/chunks and stir gently to mix together. Scrape the batter into the tin. Bake for 50 to 60 minutes, until any skewer inserted into the center of the cake come out clean with only melted chocolate stains. Remove the tin from the oven and set over a wire rack. Cool for 15 minutes then run a thin spatula along the edges of then tin. Turn the cake out, and peel off the parchment paper. Turn it right side up onto a wire rack and let cool. Serve then cake warm or at room temperature. Store cake in an airtight container, or wrapped with foil in the refrigerator. Hi Jasmine, thanks for your recipe. Just wondering if I could replace the Dutch processed power with Hershey natural cocoa powder? Looks amazing! 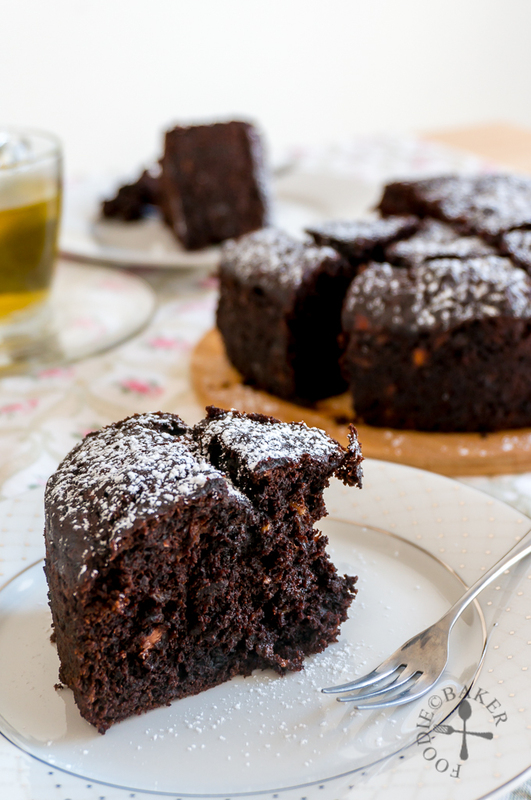 So chocolaty, moist and delicious! One slice is definitely not enough! 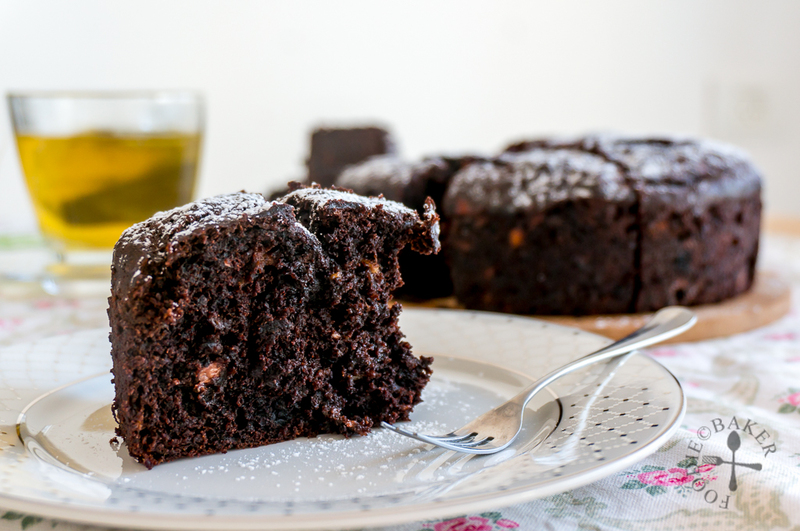 Double chocolate and bananas, i can imagine how divine this cake is! I’ve made this recipe before and it is amazing! I love your cake/round cake pan version (I made the loaf)…there’s something about round cakes and placing them on a pretty plate that makes it extra special. I am thinking I need to make this again, in a round cake tin! Double chocolate AND bananas? This cake should be licensed. It could send chocoholics off the deep end, Jasline. What a great recipe!